Have you ever wondered just how effective promotional products are? Allison Maslan is a world-renown business coach and seasoned entrepreneur. As someone who is dedicated to helping people grow and scale their businesses, Allison understands the great value of branding through promotional products. Allison hosts two business events every year: The Blast-Off Business Breakthrough, which is attended by about 500 entrepreneurs, and the CEO Success Network Retreat, a smaller event geared towards more advanced business owners. Because of the many returning attendees, Allison is always in need of new and trendy giveaways to make each event stand out. Year after year, we have created a variety of branded tote bags, full-color pens, journal notebooks, lanyards, chocolate candies and other items that Allison gives out to the attendees of her events. We also create the table cloths for the events, and stand by to fill any other promotional products needs that Allison might have. Not only do these products help make Allison’s events more memorable, they also serve to promote her events to those who have never attended! Allison is a huge fan of promotional products because she understands the value of associating her brand with tangible, functional products, that her clients (and prospective clients!) are sure to love. She also knows how critical it is to order products that stand out! With so many promotional items being passed around the corporate scene, we always encourage our clients to order products that will show off the unique aspect of their business. Are you interested in putting your logo on some out-of-the-box items? 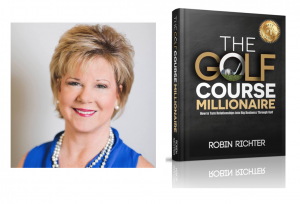 Learn how the game of golf can change your life and your business… even if you’ve never picked up a club!